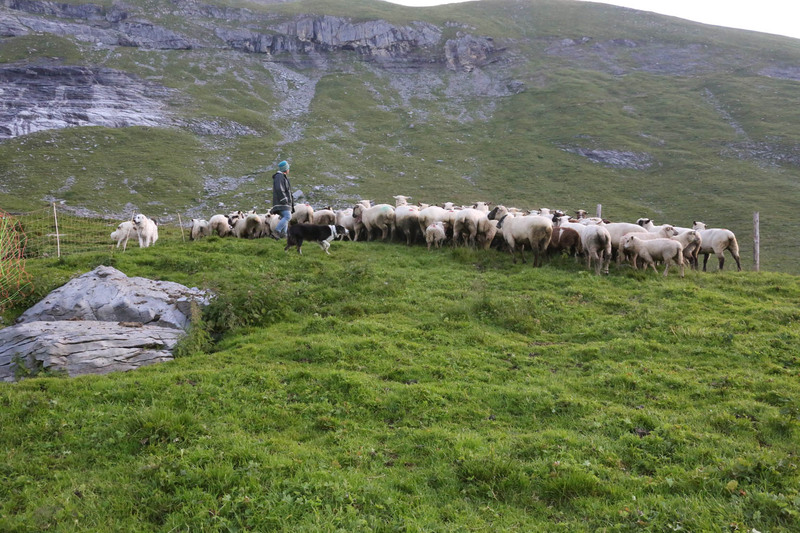 Shepherds and Shepherdesses often from South Tyrol or Germany are hired by the Swiss Sheep Owner Association to herd more than 400 sheep in the centre of the Calanda Wolfpack territory. This wolf pack was first monitored in 2012 and is led by the two adult wolves M30 and F7 (Swiss abbreviation for the wolves monitored). The pack on average consists of 7-10 wolves and its territory is the Calanda mountain range between St. Gallen and Graubünden, bordering the city of Chur in the south. Shepherds all complete the Swiss Shepherd training and certification, which has a special focus on herd management in the presence of wolves. Few have prior experience working with guard dogs. The alp is leased by the Zürich Regional Sheep Breeding Association and covers approximately 130 hectares, of which approximately 80 hectares are grazed by the sheep. The alp is between 1600 metres and 2100 metres in elevation and cannot be reached by car or tractor, so all supplies are helicoptered in, including 600 kg of dog food for the up to ten dogs for the whole summer season. The alp is divided into 10 grazing sectors, and a shepherdess daily routine involves moving the herd from one sector to another for grazing every 10-12 days, depending on the available grass. Each sector is approximately 8 ha and fenced with Flexinet, and uses natural borders where possible. The Ramuz Alp herd has approximately 400 sheep, which come from up to 23 sheep farmers, and are on the aline pasture from May until September. The herd consists of typical Swiss sheep breeds including Brown-headed mutton, Swiss White Alpine mutton, Swiss Texel sheep, moorland sheep, and the Lamon sheep. Only a few sheep are accustomed to work with herding or guard dogs, and therefore there is a period of familiarization up to 1-2 weeks until the sheep respect the dogs and vice versa. Beginning in 2013, the Alp has been protected by sheep guard dogs. The shepherds use their own border collies to assist them in their daily chores of moving and herding the sheep, plus an additional six guard dogs to protect the herd. The guarding dogs are specially trained and socialised Pyrenees Patou (Pyrenean mountain dog) or Italian Maremma Sheepdogs. Some of these dogs are owned by sheep owners others were provided by a guard dog breeder. There is a mix of older experienced in combination with younger dogs. During the nights the sheep are kept in a night paddock with two guard dogs within the fenced area and four patrolling outside the perimeter. GPS monitoring showed that the guard dogs would patrol every night along the perimeter several kilometers. The fences are the Swiss typical Flexinet electrical fences, which are 90 – 110 cm high and are normally charged with up to 5000 volts. The shepherdess sets the Flexinet fences herself, a task which takes up to 3 hours including disassembling of the previous paddock. The night paddock is typically moved every 3-4 nights. The wolves regularly approach at the beginning of the season the night paddock. The guard dogs and the sheep work in unison to warn each other of their presence, and the shepherds can recognize the tone and pitch of the howling guard dogs to determine the presence of a wolf. The guard dogs worked in a team, where 1-2 stand in the way of the wolves while the rest protected the sheep. As part of her morning routine, the shepherdess would open the night paddock, at which point the guard dogs race ahead to check if there are any wolves in close proximity in the surrounding area. During the day, the herding dogs keep the sheep in a tight flock together while the guard dogs rest. The guard dogs accompany the herd wherever they roam for the protection of the sheep but they do not keep the flock together. The herding dogs and the guard dogs cooperate peacefully. In the last couple of years with different shepherds they did not lose a single sheep to the Calanda Wolfpack. The frequency of wolf visits to the herd decreased yearly, and the shepherds are certain that the Calanda Wolf pack has learned that the Ramuz sheep herd is well protected and that deer and wild boar are a much easier prey. The Herd Management on the Ramuz Alp is supported by CH Wolf.